Keeping a few pigs to fill the freezer can be people’s first thought when they have a small amount of land. Bob Stevenson explains to Laura Bowyer what to consider when buying-in weaners, and the best practice when looking after them. When buying pigs, the first thing to consider is whether you have enough space, says Dr Bob Stevenson, a pig vet of 45 years and established teacher on the species. Dr Stevenson advises any outdoor pig enterprise is started in spring when there is plenty of grass and the ground is perhaps drier, unless the animals are to be kept inside and can then be bought at any time of year. He recommends a 40kg weaner at nine to 10 weeks of age and suggests starting with a herd of about six pigs. It is necessary to have more than a garden for the animal, he says, recommending 0.2 hectares (half an acre) per pig although a standard stable is suitable for such a small herd if they are being kept inside. Outdoor pigs also need an area which can be subdivided to rest the ground. Paddocks can be split with double strands of electric wire and pigs rotated between these sub-paddocks and grass reseeded as necessary. If kept outside entirely, the size of pig, number of pigs and ground type will determine the amount of ground required. Pigs should not be kept on their own as this will deter from their natural behaviour, he says. Dr Stevenson says: “Consider your ground type. A 75kg pig on clay ground with a heavy rainfall will just create a mess. “If you are in the west of the country, be careful of rainfall and slopes, as the bottom of a slope can become like slurry. In terms of regular health routines, pigs are fairly low maintenance, according to Dr Stevenson, but they do need worming. He adds it is a bonus if you can buy pigs which have already been wormed, but they must be correctly dosed. He says: “There will be ‘milk spot’ on the liver if they are not wormed at finishing. This will be reported by the abattoir and enable you to improve your worming programme. "A benzimidazole-dressed feed can be used, but meat withdrawal periods must be adhered to. “All use of animal medicine must be formally recorded and available for inspection. You should take advice from your vet about use of essential vaccines for your enterprise. Vaccines have an authorised zero meat withdrawal period. “Pig health can be monitored by observing your pigs but as soon as you disturb them, you will no longer be able to ‘read them’ as easily. If a pig does not come to feed, keep an eye on it and mark it. If it does not feed on two occasions, you must take appropriate action. “Keep pigs happy by keeping them feeling full with the provision of clean straw or haylage,” says Dr Stevenson. Sufficient trough space is required so all pigs are able to feed simultaneously to ensure they do not fight. “The constant provision of water is crucial. This can be demanding in the frozen winter conditions and the very dry summer months. Without water, pigs will not eat. Water needs to be provided near to the feeding area and not immediately next to the feed troughs. Dr Stevenson says if pigs are too fat, then money is being wasted getting them to that stage. On arrival, pigs should be fed two to three times per day and they should clean the trough up in 20 minutes. This will also allow frequent close inspection of the new arrivals as well as allowing a feed familiarisation period to avoid nutritional diarrhoea. Then an ad-lib system where feed is always available is required until pigs reach the desired weight. However, ad-lib feeding to heavier weights may result in unacceptable layers of fat for the butcher and consumer, if being sold on, and is also a waste of money for the keeper. 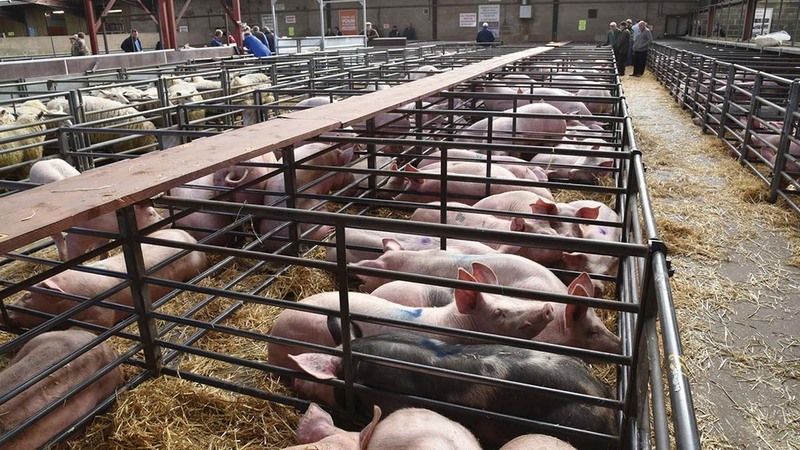 When pigs have got used to the feeding routine he advises each pig be given a kilo of feed twice a day and this regime might be used for pigs intended for pork weight at 65-70kg liveweight (see panel), depending on pig breed and type. Smallholders might want to buy small quantities of different rations from agricultural merchants. Weaner and grower rations should contain good levels of lysine and other essential amino acids. “Pay attention to label information on the digestible energy content and seek nutritional advice,” he says. Dr Stevenson advises against buying pigs on the spot. He says: “You want to buy pigs which are clearly busy, well-formed and not sleepy. If buying out of the market, be extra cautious as the animals’ health and history is likely to be unknown. I would suggest purchases are made from a respected source to minimise disease threat. “With a new environment, circumstances and feed, a stronger pig is needed so it can cope with pretty much anything. Avoid buying pigs which you notice are coughing and scratching. any diseases they may be carrying to reveal signs before mixing with the other pigs and spreading infection. There is a 20-day standstill on pigs, unless they go straight to slaughter. On mixed species holdings, cattle, sheep and goats must be kept on the holding for the six-day standstill. This means no pigs can be moved to another holding for 20 days. This is to slow any spread of notifiable diseases such as foot-and-mouth disease or swine fever. Pigs need to be legally identified with a plastic or metal ear tag, or a tattoo or slap mark can be used in some instances for slaughter. A pig keeper must have a holding number and a unique herd identifier. No pig can be moved off the holding without a general pig licence and food chain information form when going for slaughter. Following foot-and-mouth, it is illegal for any pig keeper to feed waste from any kitchen which has been in contact with meat. Vegetable waste from wholesalers is, however, acceptable.